When life gets busy, we often forget that there is a whole world just waiting to be explored. Whether that means travelling overseas by plane, escaping to a distant land through a good book or hitting the open road on a last-minute family getaway, we all need to relax and escape the everyday. So of course, I jumped at the opportunity to join the Ford Book Club and whisk my family away on a much-needed weekend getaway. Our mission was simple: enjoy a road trip while listening to a Canadian novel and driving the made-in-Canada 2017 Ford Edge. Our destination? Niagara Falls, the location set in our book of choice - Cataract City - and the city where my husband had proposed on bended knee! 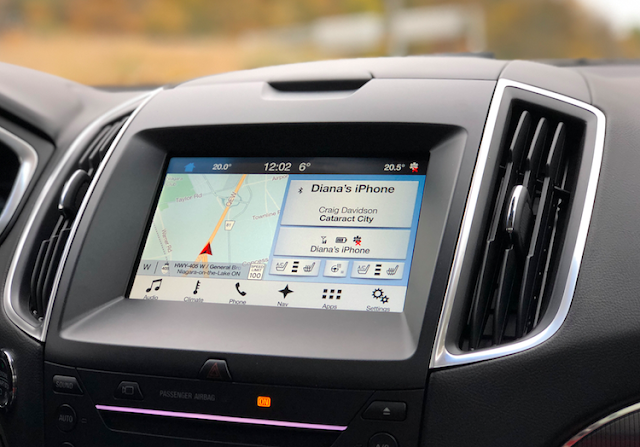 Before we hit the road, I connected my phone to the Ford Sync system. With the easy-to-use standard SYNC 3 technology in the Ford Edge, all I had to do was turn on the Bluetooth on my phone, add my device on the Ford Sync display screen and connect to the Ford Edge on my phone. Once connected, I clicked on the Audio button on the Ford Sync display, clicked on Sources and selected my phone. Then I opened my Audible Canada app and started listening to Cataract City. And thanks to the premium Sony Audio System, we enjoyed crisp sound as we listened to James Colby's narration. It was a cold, rainy day when we set out on our trip to Niagara Falls, but we still enjoyed our ride thanks to heated front and rear seats. 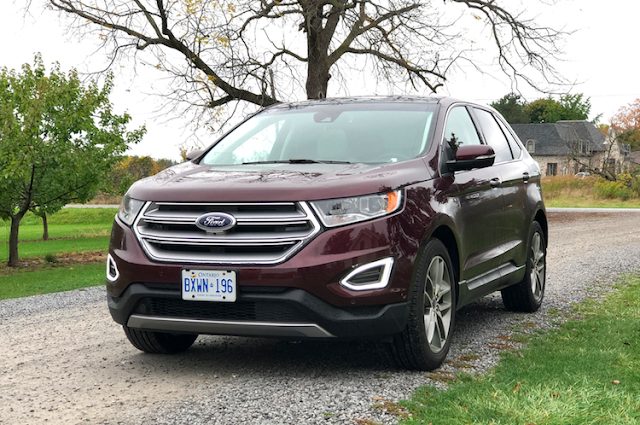 The Rain Sensing Wipers was a neat feature and the Ford Edge handled itself very well on the slick highway. 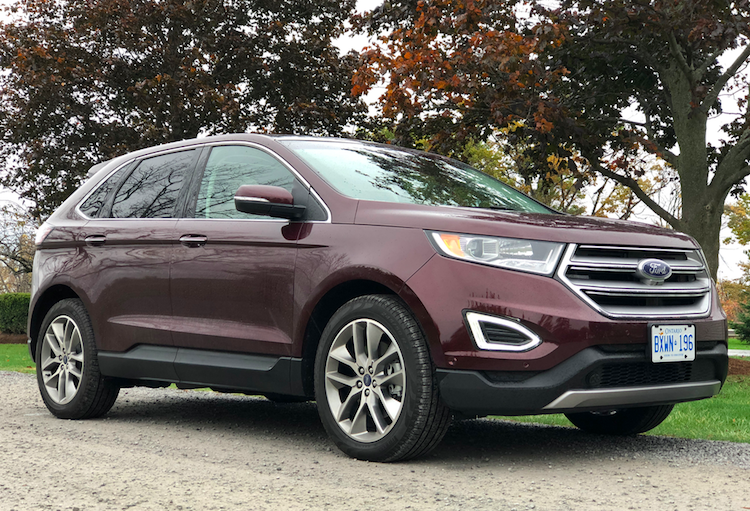 It took my husband some getting used to the Lane Keeping System but he actually suggested we consider a Ford Edge for our next family vehicle. And this coming for a man who is very particular about automobiles. Once we arrived at Niagara Falls, we checked into our hotel and decided to head into Niagara-on-the-Lake. 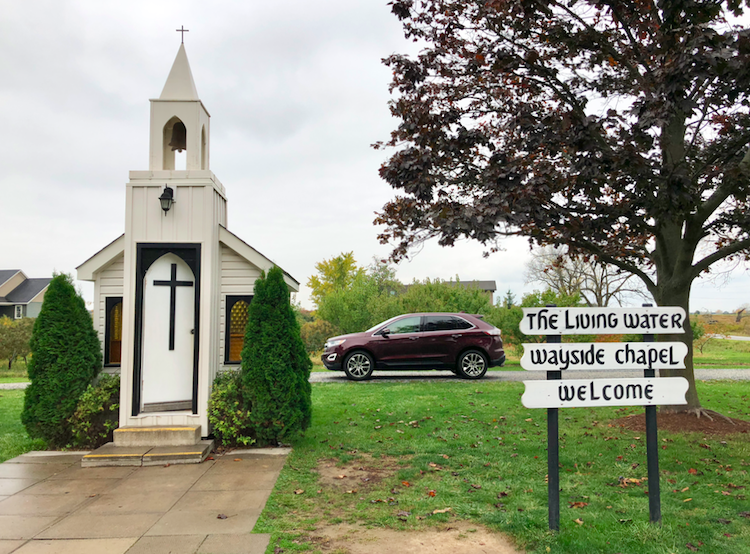 Along the way, we stopped by the Living Water Wayside Chapel, then grabbed a bite to eat on the main strip and purchased some fall accessories at the hat shoppe. Oh, and we bought some ice cream, too! 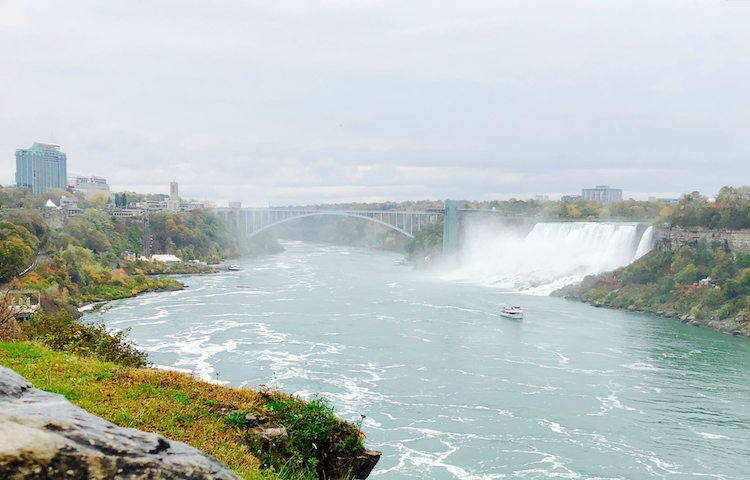 The following day, we bundled up and took in the sites at the falls of Cataract City, which is the city nickname of Niagara Falls and has its roots in the Latin word for waterfalls. We also stopped by the Whirlpool Aero Car and contemplated going for a ride. But it was a little too cold for my liking. 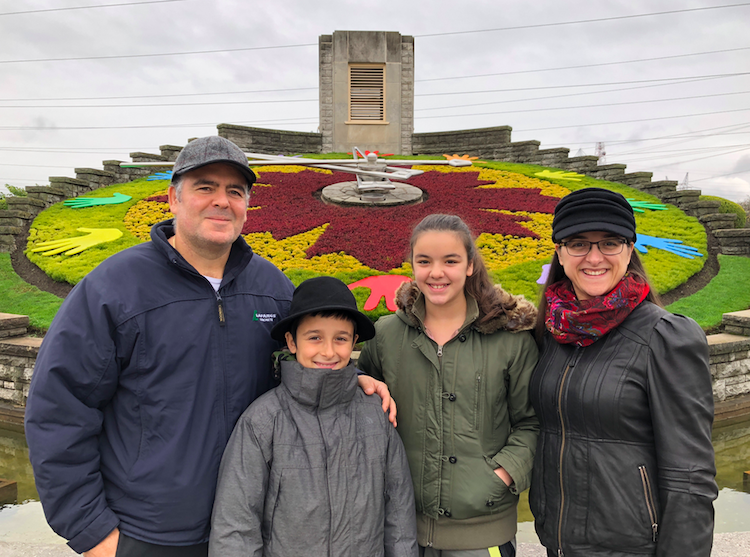 And before we headed home in our Ford Edge, I insisted we stop by the Floral Clock. This place always brings me back to my childhood when my parents would often take us to Niagara Falls. We have many a family photo at this spot, so it meant so much that I could get a photo with my husband and kids. To the kind gentleman who took this wonderful photo, thank you! It was so... Canadian of you. Disclosure: I participated in the Ford Book Club and received special perks. Any opinions expressed in this post are my own. I would love to drive an 2017 Ford Edge. Not a bad looking car, I prefer my Chevy's though! I love your family picture very nice!! That sounds like a really nice car. I love the colour too! They are quite nice looking. I prefer Chevy's but my mom really likes her new Ford Edge. Nice looking car! I love the colour. Looks like you all had a great time. We are Ford people and love the things available in this vehicle. That color is gorgeous! (reminds me of a nice glass of wine!) Looks like a solid & safe vehicle. Haven't been to Niagara yet but it's on my bucket list! It sounds like you like this car but better yet you liked your trip to Niagara Falls which only 20 minutes from where I live and it has changed so much since I was a teenager hanging out there on the weekends. Well made safe car that is affordable! I think ford makes okay cars. 2017 Ford Edge is certainly a sweet ride.Great family photo!